Today was a pretty awesome day! We had a 14mi hike into the town of Cuba and got an early start at 6am. 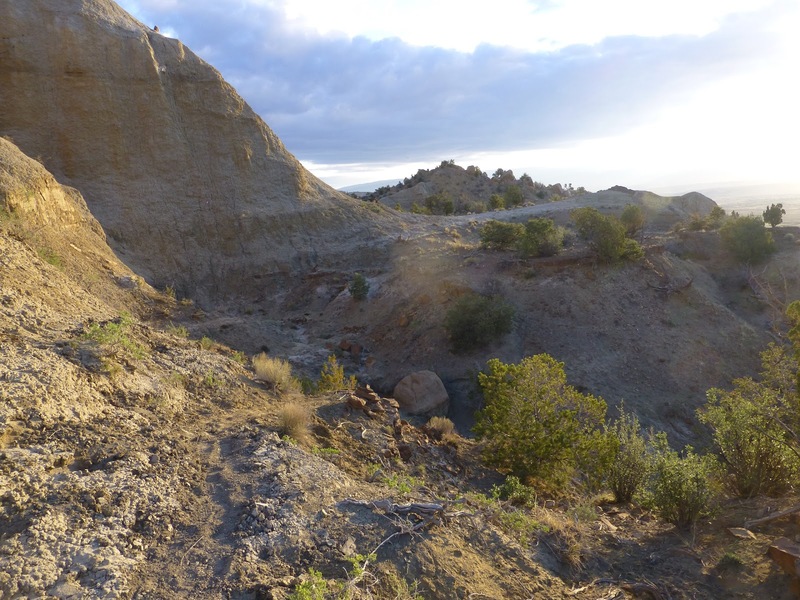 The trail and morning light was beautiful and we were treated to many more expansive views. It was a nice cool morning and pretty much perfect. I just loved it and I think it’s my favorite morning so far. The trail wound tightly along the rock as we wove in and around. We climbed up steeply and walked along the top of the mesa in deep sand. The trail is visible on the bottom left side of the picture below. My friend and trail angel, Funhog (who also created my Wired stamp) was in the area on business and wanted to do some trail magic for us this morning too! I knew she’d be hiking in to meet up with me, but didn’t know she’d also have a treat for the group! She chose to continue her day hiking and left us the key to her car so we could find a special treat in the car…a full dutch apple pie! 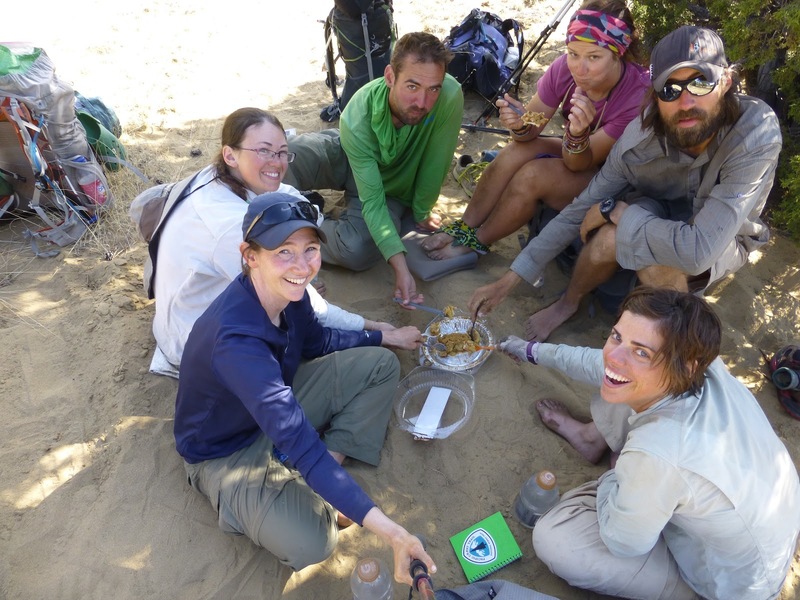 All six of us sat down in the sandy dirt road and indulged and we ate the whole thing. Pretty great trail magic! THANK YOU FUNHOG!!! Funhog also told the group that anyone who wanted to leave their pack in her car could, so that they could slack pack the final 7mi or so into Cuba. Ninja and I kept our full packs, but the rest of the group was excited to drop the weight for the road walk into town. The clouds were just great today! I know the stitching on this picture isn’t perfect, but I just had to use it to capture the great view we had! When we got into Cuba, we ate McDonalds and got to our motel. We are staying at the Del Prado, which I have to give a special comment about. From the outside, it looks like a rundown and shady place and if you give it a chance, it is really a perfect place that welcomes hikers in the most wonderful way! Mrs Yang greeted us and had plenty of supplies for hikers. She took our pictures and had her son who is about 11yrs old there to assist in carrying our boxes and such. She has a hiker book we all signed and we could see the pictures pasted in of hikers from previous years and her son when he was much younger. Mrs Yang even has two laptops for hikers to have in the rooms and offered to do our laundry in her home washing machine which is on the premises. I just had to give another example of how welcoming people are along the trail and that, like stinky dirty hikers, you can’t always judge a book by its cover. Once we got settled, Drop-N-Roll, Ninja, and Strider were picked up by DNR’s cousin and left to spend the night outside of town. 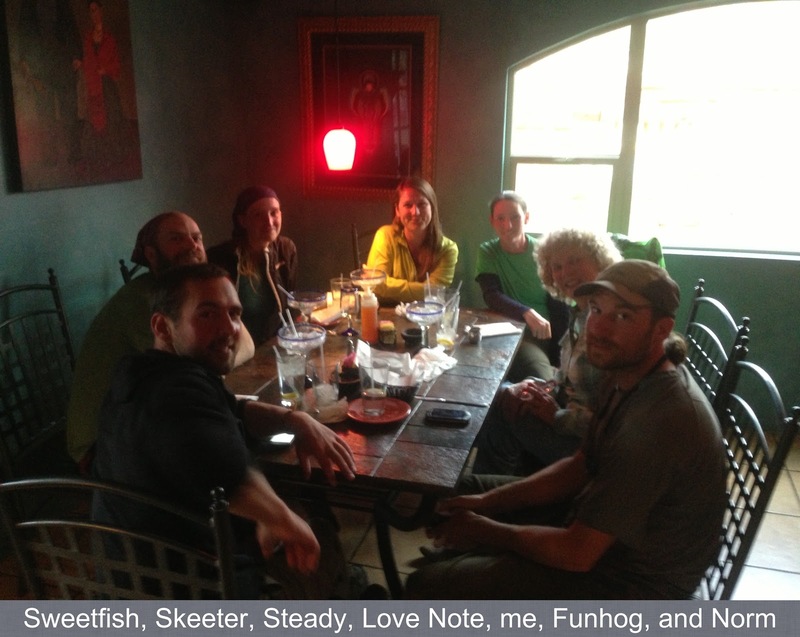 Sweetfish, Love Note, and I got a room and met a couple that we have just caught up to that we haven’t met yet, Skeeter and Steady. Later in the afternoon, a fast hiker named Norm came into town and is also staying with us. It’s another full house! We all went to dinner with Funhog at the nationally known Mexican restaurant called El Bruno’s. It was great to meet new hikers and spend time with Funhog. The big news of the day is that there is a wall of snow ahead of us…it isn’t looking fun. It will be beautiful and I will get to experience the epic San Juans in snow, but it will be difficult. There was late snowfall in the San Juans and we should be hitting our first snowy sections in the next few days. Those who are about a week ahead of us are warning that the snow is very deep and unlike the snow we hiked on in the Sierra. It has been described as mashed potato snow that you sink deep into with every step. If anyone out there hiked through the San Juans on the CDT in a high snow year, I’d like to hear your experience and advice. Some are even recommending snowshoes. How does this affect my hike? Well, I can say that there is definitely no need to push to get to the San Juans and that I will be taking it much easier the next week or more. I definitely want to go through the San Juans and the low level alternate is not what I want. It will probably mean that we will have long days in deep snow so each leg may take a day or two longer than hoped. It is frustrating, but can’t be changed, so we just have to accept it and go through it the way we did on the record high snow year on the PCT. This is definitely not a record high snow year for the San Juans, but it is a late snow that is causing us to have an unusually high amount of snow at this time of the year. Whatever happens, it’s sure to be an adventure! I plan to leave with Love Note tomorrow at a leisurely pace and we have a couple days to an amazing place called Ghost Ranch where we will all probably take a zero and reunite as a larger group. Good times ahead!